87 year old Author Jack Matthews has published seven short story collections which have been reviewed favorably by New York Times Book Review, London Review of Books, LA Times, Washington Book World and USA Today. In addition, Matthews has published hundreds of stories in smaller literary magazines around the U.S. Despite the prodigious output, it’s been a while since the last Matthews short story collection has been published…..actually, it’s been 20 years! To rectify that, Personville Press will publish four new short story collections by Jack Matthews. The first collection, Soldier Boys, will be published in August 2013. It depicts how ordinary Civil War soldiers deal with the rigors of war and have to confront life-and-death questions. Ironically, war itself is not so much the main subject of the book as how individuals deal with the insanity while trying to live a normal life…and ultimately how they make their peace with it. Like other short stories by Matthews, they are suspenseful, tricky, humorous, contemplative and even spiritual. Reading about the Civil War doesn’t sound like “fun reading, ” but it is certainly relevant in an age where US soldiers are being sent to fight in faraway places for controversial reasons. The stories are less about the subject of war but than the challenges of growing up in dangerous circumstances and learning enough resilience to survive. This collection reflects Matthew’s interest and fascination with 19th Century America. 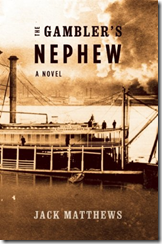 His most recent novel, the Gambler’s Nephew depicts how the accidental death of an escaped slave has repercussions on an entire town. His novel Sassafras (published in the 1980s) depicted a traveling phrenologist who has all sorts of comic misadventures during his travels. Matthews has also collected lots of soldier memoirs and written essays about some of them for his nonfiction books. This story collection will be published as ebook in late Spring. After this ebook, another volume of short stories (called Abruptions: 5 Minute Tales to Awaken the Mind) will be published in Summer, 2013.